This chapter summarizes and discusses the findings of the study, which suggest the impact of conflicting discourses and cultural scripts, competing in shaping participants’ subjective understandings and experience of free time as well as conceptions of the self. 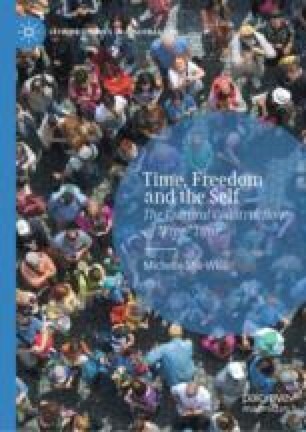 The discussion puts special emphasis on discursive contradictions and the question of freedom in free time, looking at how culture directs actions and shapes meanings related to free time and the self. Cain Miller, Claire. 2015. Stressed, Tired, Rushed: A Portrait of the Modern Family. The New York Times. https://www.nytimes.com/2015/11/05/upshot/stressed-tired-rushed-a-portrait-of-the-modern-family.html?_r=0. Accessed Nov 2015. (The) Economist. 2014. In Search of Lost Time: Why Is Everyone So Busy? https://www.economist.com/news/christmas-specials/21636612-time-poverty-problem-partly-perception-and-partly-distribution-why. Accessed April 2015. Shir-Wise, Michelle. 2018. Disciplined Freedom: The Productive Self and Conspicuous Busyness in ‘Free’ Time. Time and Society. https://doi.org/10.1177/0961463x18769786. The World Bank. 2018. Fertility Rate, Total (births per woman). https://data.worldbank.org/indicator/SP.DYN.TFRT.IN. Accessed Aug 2018. Weaver, Libby. 2017. Busy, Tired, Overwhelmed? You’re Not Alone. Huffington Post. https://www.huffingtonpost.co.uk/dr-libby-weaver/busy-tired-overwhelmed-yo_b_16121068.html?guccounter=1&guce_referrer_us=aHR0cHM6Ly93d3cuZ29vZ2xlLmNvLmlsLw&guce_referrer_cs=dPz6lhWlLvj6pEyk6nsz1g. Accessed July 2018. Weissmann, Jordan. 2012. Why Only Yuppies Feel Busy, An Economic Theory. The Atlantic. https://www.theatlantic.com/business/archive/2012/07/why-only-yuppies-feel-busy-an-economic-theory/259534/. Accessed February 2013.